Well, I left the blog for a while because I have got busy with this and that. The travel story is going to continue, but I put a short pause in it. Some of you might already know where I am now from the opening picture. 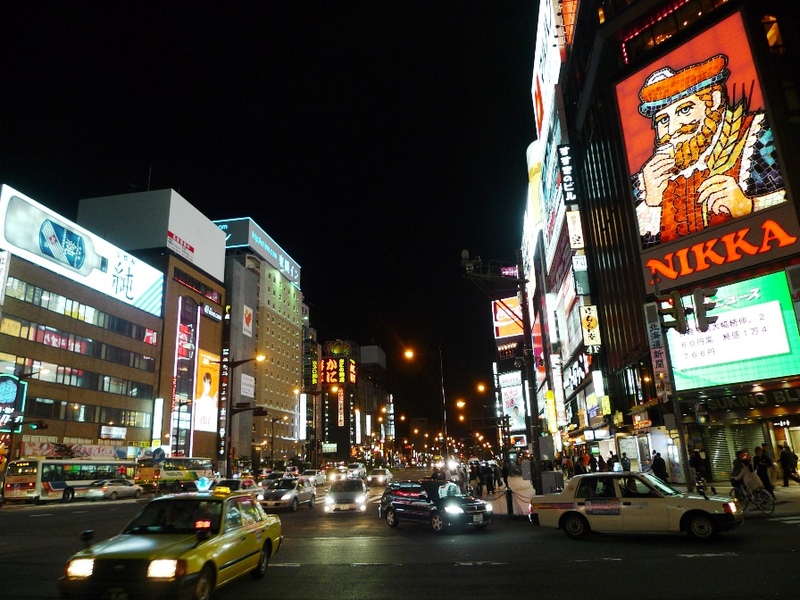 Yes, I’m in Sapporo, Hokkaido on business. I got up at 3:30 in the morning and took the first fright today, so after having a quick dinner I directly went back to my hotel. 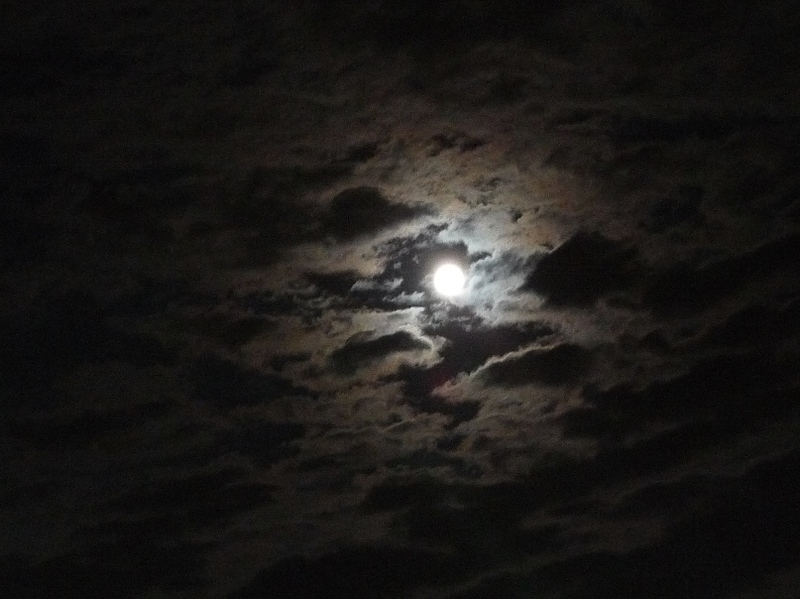 I’m watching the harvest moon in the northern land this year. 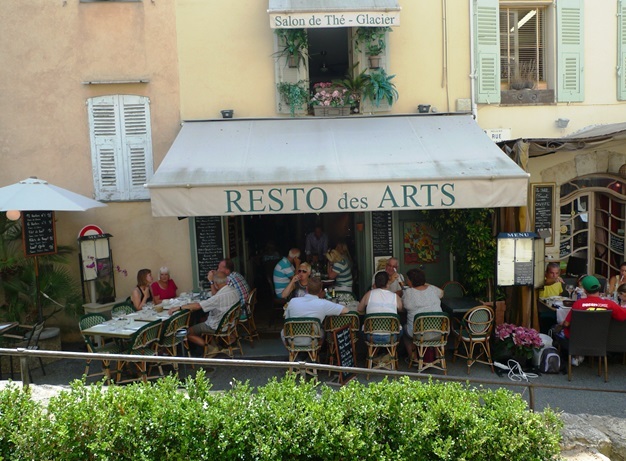 The village has been famous for “gastronomic village” in the wake of that the famous shef, Roger Vergé, founded his restaurant in 1969, which was only seven restaurants in it at the time. 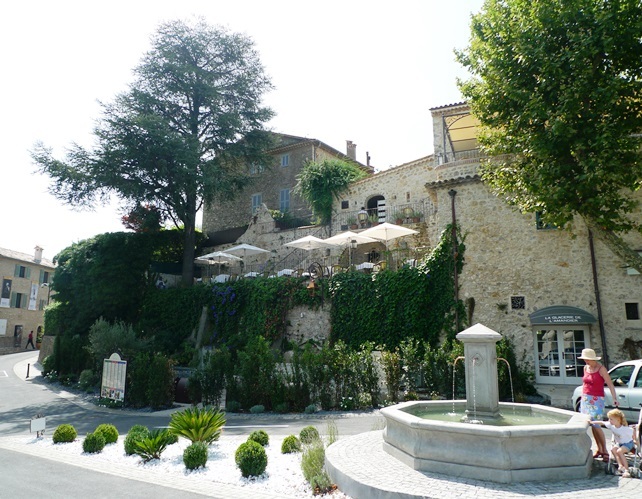 Now, there are more than fifty restaurants in this small village. Originally, it was already an important strategic point in Roman times, due to its proximity to the Aurelia road, and then, it became one of the richest centers in the region in the 19th century. 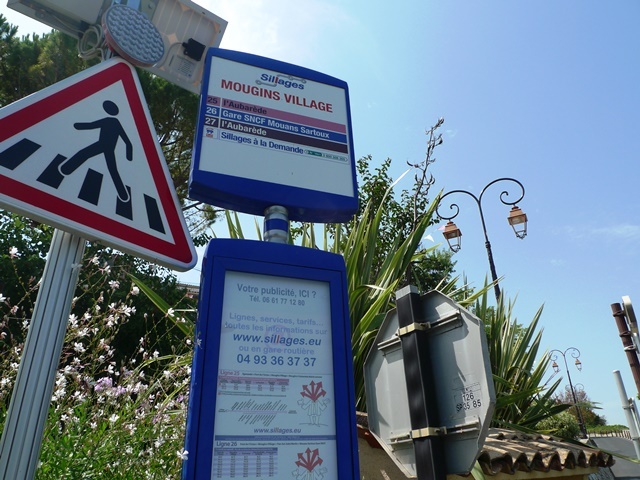 In general, to the village by public transportation, one has to take a walk for 15 to 20 minutes from “Val de Mougins (in outside of village)”, a stop of bus No. 600 running between Cannes and Grass. It was convenient because the bus comes every 20 minutes, but the subsequent walk, especially under the burning sun in this season, would threaten the survival of us. So, I looked for a way to get the village using other bus, and found it! 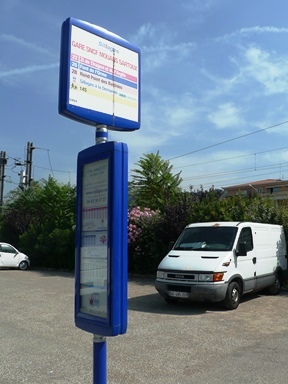 It’s Sillages, a zone-based bus service in Mougins and Grasse region. The Sillages bus No. 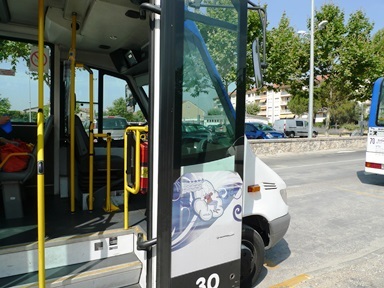 26 and 27 run between “Val de Mougins” and “Mougins Village (at the entrance of village)” on weekdays though the operation is less frequent. 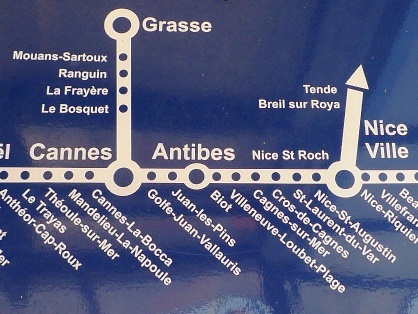 From Nice, you can go to Cannes first then take the bus No. 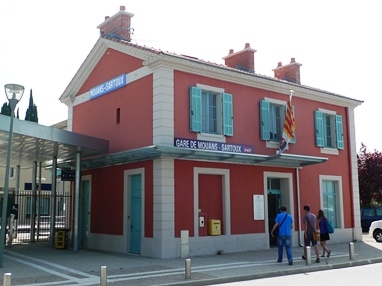 600 and change buses, but I took an alternative route: taking a train from Nice to Mousan-Sartoux SNCF station, which is next to the last station of Grasse, and then taking the bus No. 26 at 11:25 to the village. 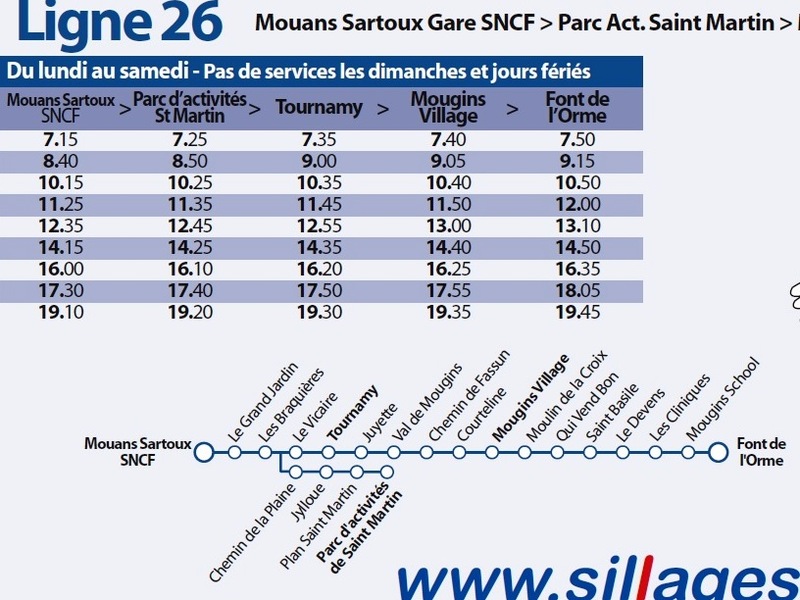 Using this route, you have a lay-over for about 40 minutes in Mousan-Sartoux, but don’t worry. 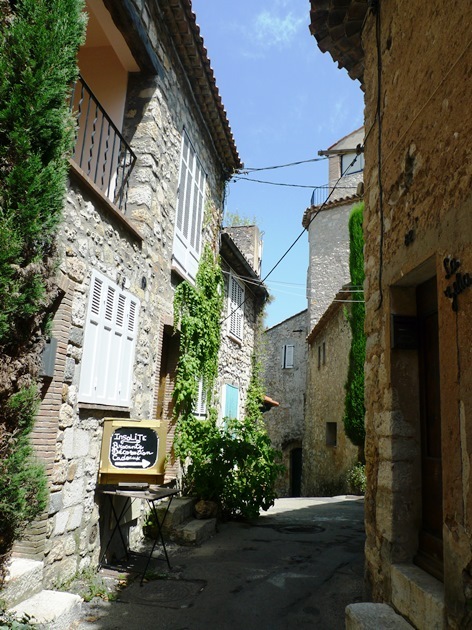 The Mousan-Sartoux village is within a 2-minute walk, so you can stroll around it. We had coffee at a café in the village. The No. 26 bus swings by “Parc d’activites de Saint Martin” after leaving “Les Braquieres” on the way to “Mougins Village”. There were two buses including No. 26, so I asked the driver which would go to Mousins. We met an English lady living in the village in the bus. 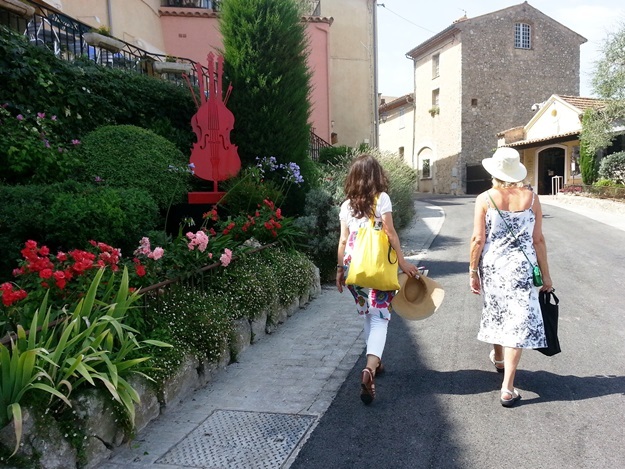 She talked to me and asked if we came from Japan when we got off it at “Mougins Village”. She said that her son used to live in Japan and has loved our cultures. His girlfriend is Japanese, and she is going to meet her in autumn for the first time. It’s one of my back shots with the lady. It took about 1 minute from the bus stop to the center of village. I asked her recommendation for a place to have lunch, and she told me two options: (1) L'Amandier, a fine restaurant with a lovely view from terrace tables (you can see the view of the opening photo from it) and (2) Le Restau des Arts, a relatively reasonable restaurant many locals visit. 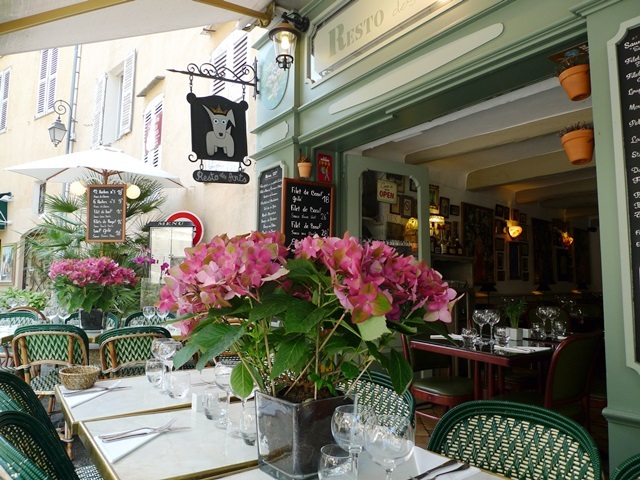 This time, we preferred a restaurant locals use daily, so we chose Le Restau des Arts that was a perfect place to have casual lunch. 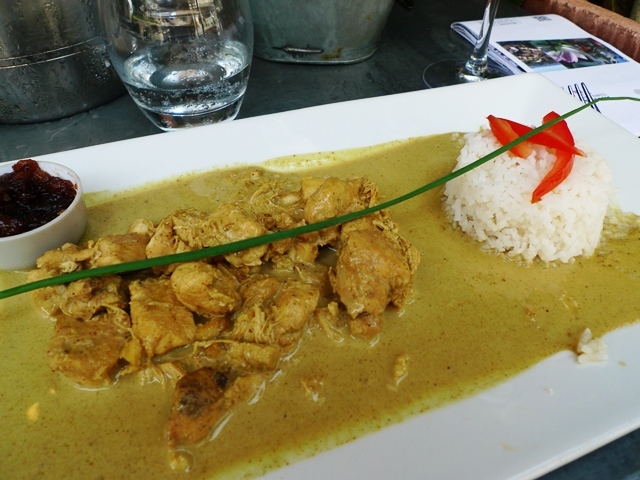 It had a different name, but it was chicken curry. The taste was familiar to me. 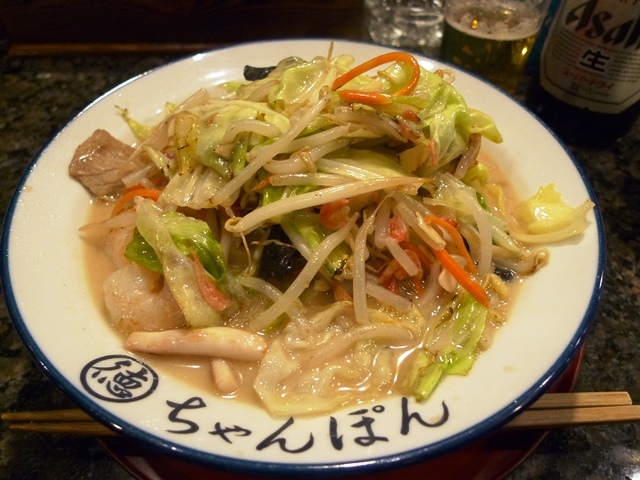 In Japan, japanized curry and rice is one of Japan's most popular dishes. 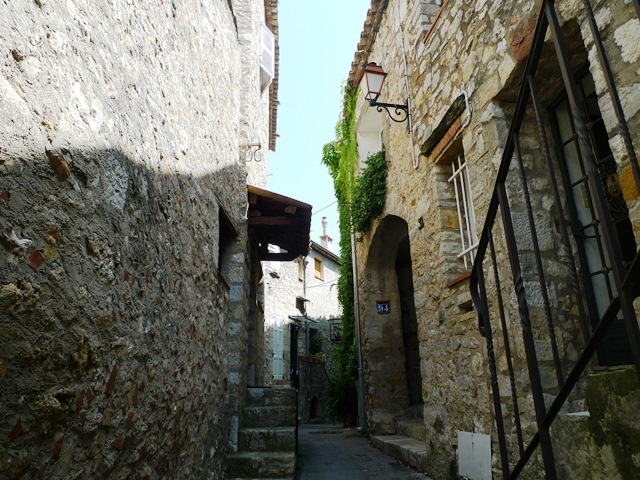 After lunch, we strolled around the village with narrow streets that seem to roll up like a snail’s shell. 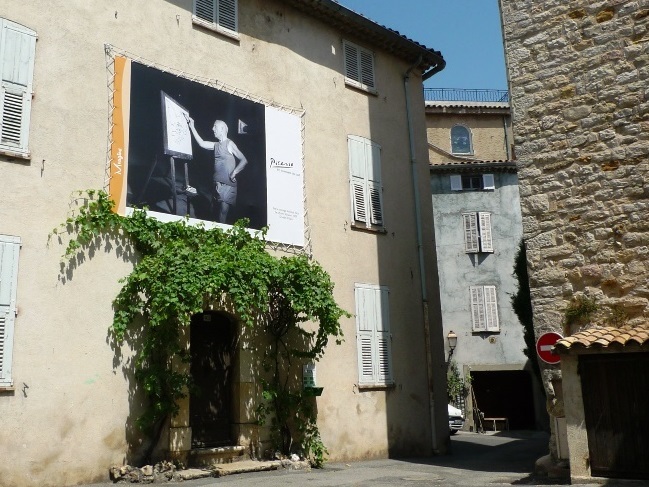 Many artists including Picasso, Cocteau, Léger, Man Ray, and Yves Klein and celebrities including Yves Saint Laurent, Christian Dior, Winston Churchill, Catherine Deneuve, and Édith Piaf lived there. It’s famous that Picasso spent the last 12 years of his life (1961–1973), where he died. We took a bus No. 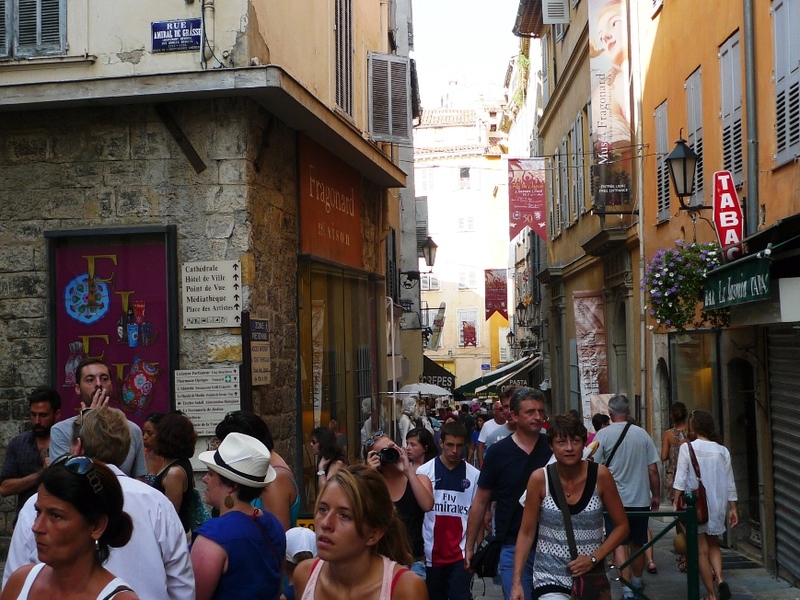 27 at 14:45 to “Val de Mougins” and changed buses to Grasse. The name of the town reminds me of a novel, Perfume, I read back in the day. It was not until I read the book that I knew about the town. 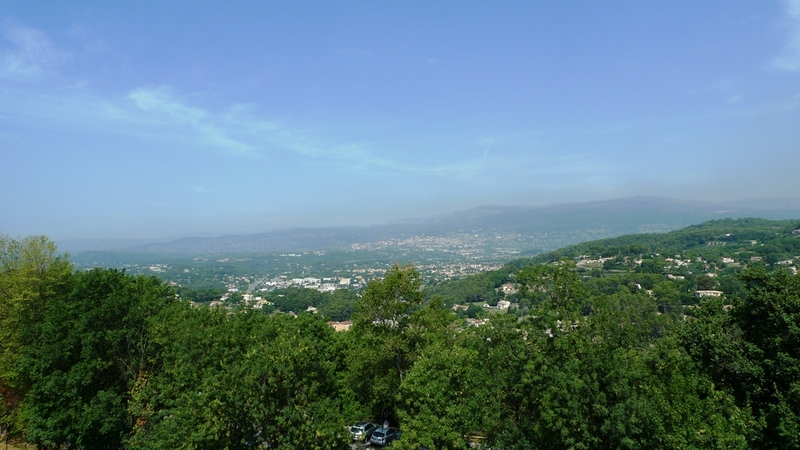 As we all know, Grasse is a capital of perfume. The town, the largest one in the nearby area, has had a prospering perfume industry since the end of the 18th century, and some major perfumeries are still based in it. 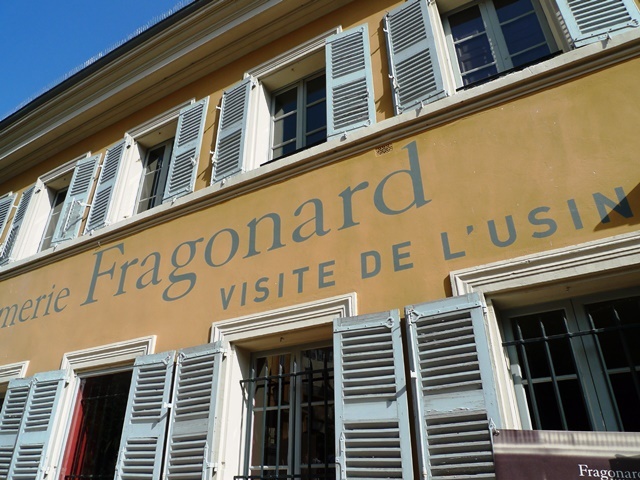 Especially for tourist facilities, Fragonard wildly opens door to tourists. 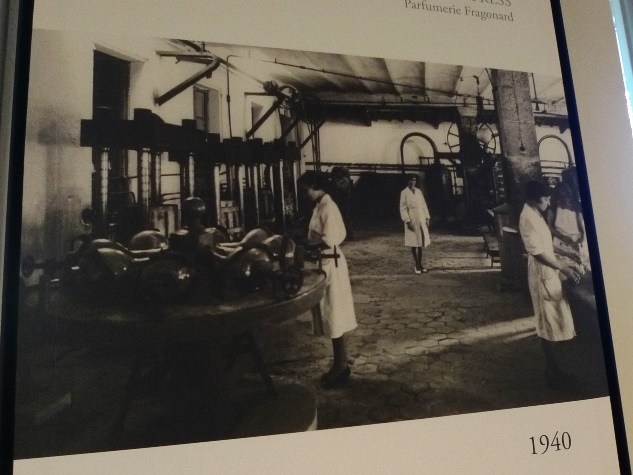 There are several museums operated by the perfumery including free ones. 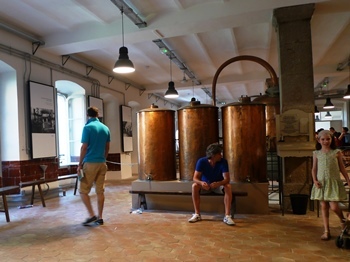 We went to three Fragonard museums for free: Villa-Musee Fragonard, Musee Provencal du Costume et Bijou (it was definitely worth seeing), and L’Usine Historique. The last one features a shop that sells their products at ex-plant prices. 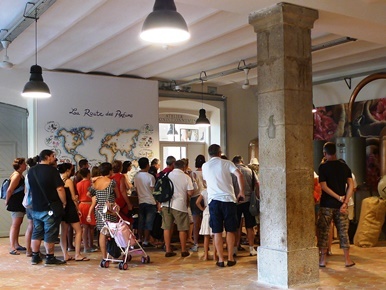 I was surprised that many visitors made a large purchase. In Japan, perfume including eau de toilette and eau de cologne doesn’t reach masses as compared to Western countries. Some people daily wear them, but most of them use ones by cosmetics makers and Fashion brands, not by a perfumery. Except few fragrance connoisseurs, most Japanese (including me who have stuck with Guerline from my twenties) don’t know about products of long-established perfumeries such as Fragonard, Molinard, and Galimard.